Sometimes you settle in for some PC gaming or web surfing. And you just don't get up. 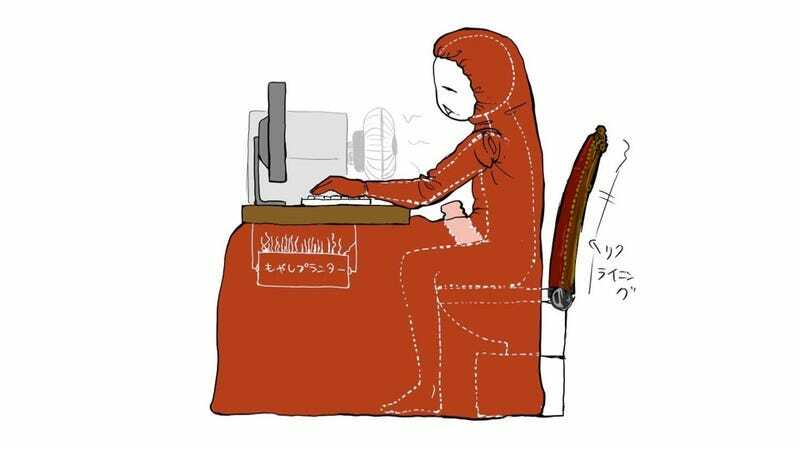 You can feel your bum go numb and the chair meld into your skin. Surely, you know the feeling. If so, maybe the above internet-produced desktop design would appeal to you. And if it appealed to enough people, it would probably end the world as we know it. Meh, who needs that anyway? We've got computers! "Haijin" (廃人) literally means "a disabled person" in Japanese. However, it's now also being used to describe those who are addicted to online gaming, "netoge haijin" (ネトゲ廃人). The term first appeared in 2009, when the Japanese media started reporting about those who played lots of online games. Some of the TV news pieces were questionable, like this 2010 report, which featured one gamer with a bottle to urinate in. Japanese News: Online Game Addict&apos;s Pee Bottle Appears? If someone asks, "Is this news?" The answer is, well, this is Japanese TV news. Regardless of how accurate the reporting in Japan has been, a thread popped up on 2ch, Japan's largest bulletin board, in which folks designed desktops which used human waste to power the computers, under the premise they would lead to the ruin of humanity. Yes, the individual is sitting on a toilet. In the toilet, it says "electric generation" (発電 or "hatsuden"). Under the computer, it says "electric power utilization" (電力 or "denryoku"; 使用 or "shiyou"). Features were added, such as this reclining chair back. Someone pointed out it wasn't possible to *coughs* pleasure oneself, so a fleshlight like device was added. Hands free? Then a fan that uses excess heat from the computer was added. That's sensible. Finally, someone asked if there was a way to grow food, using electric power and excess heat from the computer. It was decided that bean sprouts were best, so that's why there are bean sprouts below the computer. Ladies and Gents, the end of humanity.